Primary School students are characterized by innocence and purity of thought. Their first encounter with Jewish Studies is critical. After several years in which they have learned Mikra – Torah and N’vi’im – they come to the critical first meeting with Torah Sheb’al Peh. Almost everything we know today as Judaism flows from the Torah Sheb’al Peh, and even mature understanding of Torah Shebichtav comes from Torah Sheb’al Peh. The foundation of the Torah Sheb’al Peh is the Mishnah. With incredible wisdom and terse linguistic design, Rabbi Y’hudah HaNasi included the essence of the entire Torah until his day in the Six Orders of the Mishnah. In addition to the value of knowing and learning of Mishnah on its own, study of the Mishnah is the basis for progress to the learning of Talmud. Therefore, the way in which Mishnah is studied is all-important – including the term devoted to learning, the effort in learning, the curriculum and the learning materials for Mishnah. In the study of Mishnah content, Bonayich materials emphasize shinun, the initial, exact learning of Mishnah by heart, in song, with joy and intensity. After shinun, students proceed immediately to comprehension of words, phrases and concepts. In this way, students may learn full chapters and tractates of Mishnah. Together with the content, Bonayich materials present the study of Mishnah skills. Acquisition of appropriate skills provides the student with tools for even deeper and more meaningful study of Torah Sheb’al Peh. The skills are organized in a scope and sequence appropriate for the cognition of primary school students. When learned together, the content and skills builds the student as an aware and independent learner of Torah. Both the study of content and the acquisition of skills are presented in V’Shinantam in an experiential and enjoyable way, with color learning materials in high graphics. These materials include Student Activity Books, Teacher Guides, teaching aids, posters, learning centers, digital and technological aids, and much more. V’Shinantam is best used together with the original Mishnah text alongside the activity book. To ensure effective instruction, all teachers participate in a preliminary in-service in Mishnah study and teaching with V’Shinantam, and receive guidance and accompaniment in implementation of the program, as needed. No teacher left behind! Teacher manuals, teaching aids, Smart Board. 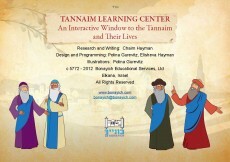 nteractive, digital window to 100 Tannaim and their lives.